Groundbreaking Ceremony, May 2, 2019, 11:00 a.m. Since 1949, Donnelly’s rich legacy of expanding access to higher education has helped thousands realize their personal version of the American dream. ​Because of Donnelly’s commitment to keeping our private Catholic college education affordable, historically the College has been limited in resources to invest in long-term needs, including modernizing the campus infrastructure, enhancing learning resources, and improving financial stability. Reversing that trend, College leadership has prioritized completing our master plan and investing in these areas as a critical component for future growth, beginning with the development of the 3-phase campus master plan in 2008. 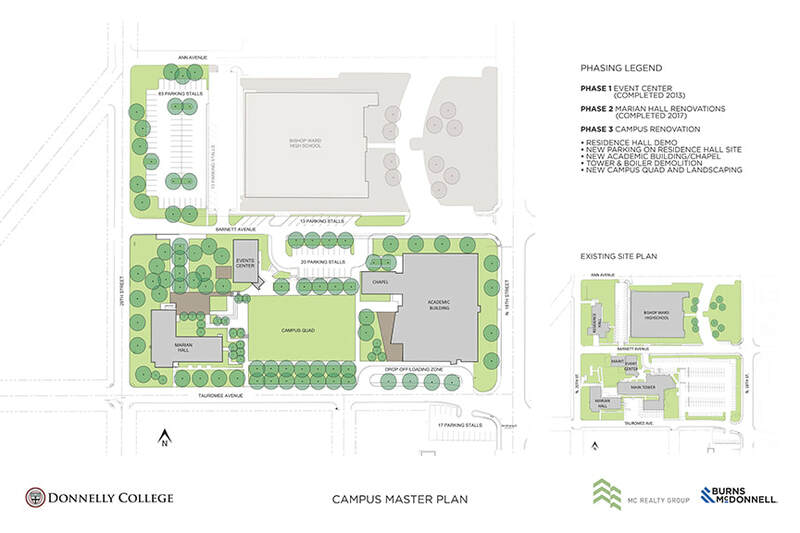 Transformations: The Campaign for Donnelly College is making this campus master plan possible, and providing an opportunity to grow the endowment ensuring that our mission will go forward into the future in a vibrant and sustainable way. Phase I - Completed in 2013 with the grand opening of a new Community Event Center – Donnelly’s first new construction project in the College's history. The Event Center has not only provided a space for Donnelly to host guest speakers and campus events, but for the community to host events such as mayoral debates, congressional town hall meetings, forums and more. Phase II - Completed in 2017 with the renovations to Donnelly’s second academic building, Marian Hall, which houses Donnelly's nursing program as well as other learning spaces. Renovations added nine new classrooms, six faculty/staff offices, a computer lab and a collaborative study space. We modernized the elevator, added sprinklers, and improved mechanical systems throughout the building. Our usable academic space doubled to 22,000 square feet.